Traditional farmer’s markets or fruit stands give farmers a chance to sell limited quantities of their product and hopefully build a customer base in their area. Returning weekly customers give the farmer an opportunity to establish a name for themselves and their product. Most of your neighborhoods host farmer’s markets, especially during the summer months. The option Testa’s offers to farmers is food distribution. At the beginning of the growing season, we work with our farmers to determine commodity type and volume they will provide us during that season. This guarantees the farmer will sell 100% of his crop that year at a maximum profit and that Testa will be able to provide great local produce to our customers. Everybody wins! Testa Produce has established deep-rooted relationships with our local farmers to ensure you receive the freshest, best tasting local produce available. Their names are listed to the right. Thanks to these dedicated farmers, we are able to consistently provide you with delicious, local product. 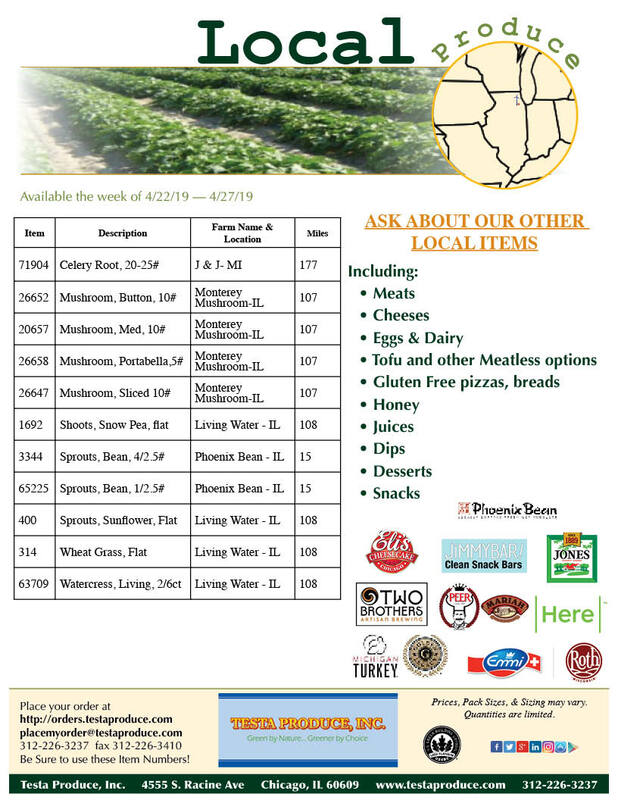 Make sure you check out our weekly Local list and talk to your Testa Sales Rep to learn more about our local program and available local produce. Click here or the image above for local items available this week. Local Produce is fresh and flavorful, plain and simple. Local farms grow for variety and flavor and tend to use sustainable farming practices including pesticide free, non GMO (Genetically Modified Organism) farming so it makes sense that so many people agree that the local produce initiative is here to stay, and one worth pushing! Buying local helps support our family farm neighbors while helping to promote community awareness about where fresh, local produce comes from. It is important now, more than ever, to promote sustainability. Everyone should take steps to reduce their individual carbon footprint and local produce is the perfect example for sustainability in food. Not to say you need to go to the lengths we did and install a 238-foot wind turbine in your front law, but all the small details add up. Simple things like eliminating a delivery day, or not taking second or third deliveries help reduce your footprint by decreasing the amount of fuel and reefer used on a daily basis for transport. For all of you mathematicians out there, here’s a word problem: The distance from the Salinas Valley to Chicago is roughly 2,300 miles (about 169 gallons of diesel fuel, one-way). The trip to Michigan on a single tank of gas (with plenty to spare) is 100 miles. The average Midwest growing season lasts approximately 20 weeks. How many gallons of diesel fuel are saved by buying local? The answer: A savings of about 160 gallons of gas, per one-way trip is incurred, so if we take into account the entire 20-week season, that is a total of 3,200 gallons of diesel fuel! Wow. One more step: Multiply that by all the distributors in the Midwest.. now that is a lot of oil saved! How’s that for lessening our dependence on foreign oil? So buy local and save the earth. Sounds great right? Well, there’s a catch - we are used to getting Lettuce year round, Strawberries in January, Peaches in December, and Avocados in March. Avocados can’t grow in the Midwestern climate, Strawberries only grow for 3-4 weeks in the summer (with good weather), and Lettuce can only grow when it doesn’t freeze at night. 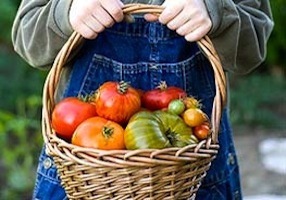 Both anticipated climate and unpredicted weather, in addition to local farmers occasional inability to produce enough for demand, means that we can’t look at local produce as the ‘only’ solution - it’s a good addition. We try our best to make sure your local needs are taken care of, but sometimes, growing circumstances are beyond our control.